The Banqueting House, Whitehall, is the grandest and best known survivor of the architectural genre of banqueting house and the only remaining component of the Palace of Whitehall. Originally built for entertaining guests of the monarch in the early 17th Century, the majesty and grandeur of Banqueting House has not been left to history. The spectacular South West London venue has impressed and inspired guests for centuries and you and your guests could experience this magnificent venue for yourself during your wedding day. Whether you’re planning an extravagant event or an intimate affair, the Banqueting House has the perfect space for you. With top quality service and mesmerising surroundings, the house provides a stunning backdrop for your unforgettable day. As of 2015, the exterior of the Banqueting House has been restored to its original splendour. The Main Hall was created for the specific purpose of entertaining in 1622. The hall can accommodate up to 400 for the ceremony, 450 for the reception or 300 to dine and dance. 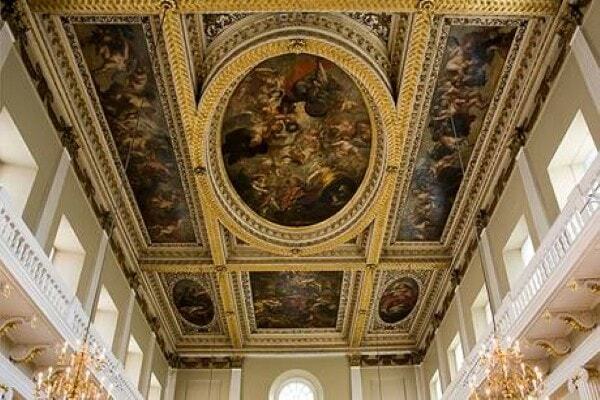 One of the most magnificent elements of this room is the grand masterpiece of a ceiling by Sir Peter Paul Rubens. A true treat to behold, the ceiling accentuates the majesty of the venue in a spectacular manner. The Undercroft provides a beautiful ambience for your celebrations. Once the retreat from public life for Stuart kings, the intimacy of this stunning vaulted location remains. The Undercroft can hold a maximum of 150 guests for a ceremony with 380 for a pre-wedding breakfast, or pre-dinner reception. For your reception or evening’s festivities, the room can accommodate 250 guests and 120 for a wedding breakfast.